The blood-type diet designed by Peter D'Adamo contains four sets of eating and lifestyle instructions, one for each of the four blood types: A, B, AB and O. According to D'Adamo, if you adhere to the recommended foods for your particular blood type, you will become more energetic, lose weight and decrease your risk of developing medical problems. Type O individuals -- whether O positive or O negative -- are advised to avoid most grains, but can eat rice occasionally. Health professionals warn, however, that little scientific evidence supports the effectiveness of the blood type diet. Speak to your doctor about the possible drawbacks before making major changes in your eating habits. D'Adamo contends that people who have type O blood are directly descended from ancient hunters. These prehistoric people consumed primarily meat and fresh fruits and vegetables. Because of this genetic inheritance, D'Adamo says individuals with type O blood must eat a diet that severely restricts grains and dairy products because these foods contain lectin compounds that, according to D'Adamo, are incompatible with type O blood. In the blood type diet, no dietary distinctions are made between type O-positive and type O-negative blood because the Rh factor protein that determines this is not thought to be affected by lectins. Rice is not an optimal carbohydrate source for type O individuals, but it is allowed in moderate amounts. D'Adamo says people in the type O blood group can usually consume two servings of rice weekly without experiencing weight gain or health problems. 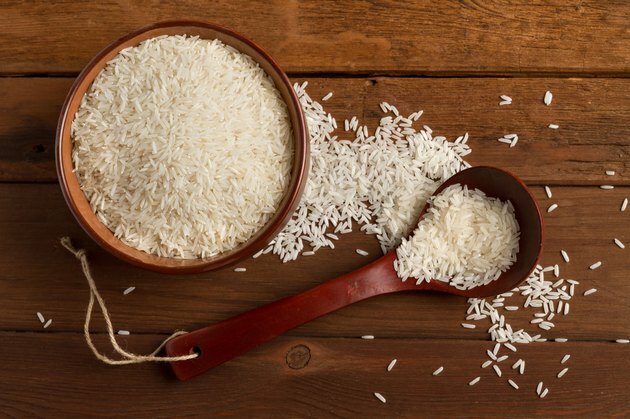 This can include any type of rice, such as white, brown or wild rice, as well as specialty types such as jasmine, arborio or basmati. A number of other grains -- including barley, millet, buckwheat and spelt -- are considered acceptable for type O people in the same moderate weekly amounts as rice. Instead of rice, D'Adamo urges type O individuals to get their carbs from Ezekiel or Essene bread. Ezekiel bread is a flour-less bread made from a combination of ground sprouted grains, such as sprouted rye, brown rice and oats, while Essene bread is made from a single ground sprouted grain combined with water. People with type O blood following the blood type diet are instructed to avoid both wheat and white flour, corn, gluten and bulgur, all of which supporters say will cause type O individuals to gain weight and experience disruptions in their glucose metabolism. MayoClinic.com reports that the assertions of blood type diet proponents are not supported by scientific evidence. David Katz, director of the Yale-Griffin Prevention Research Center, says adhering to some parts of the blood type diet -- particularly the diet recommended for type O people -- might result in vitamin and mineral deficiencies. It can also prevent you from receiving the amount of whole grain fiber needed for you to prevent conditions such as cancer or heart disease. Eat Right For Your Type: What Makes a 'Type O' Individual? Mayo Clinic: Blood Type Diet -- What Is It? Does It Work?